Over the last few years, breathwork has gained popularity in the wellness community. Practicing various breathing techniques can help with things like anxiety, stress, relaxation—and it even give you a natural high. Embracing the power of breathwork, Different Breed gym combines breath technique and resistance training in a transformational new workshop. We spoke to Kyle, Head Coach and Owner of Different Breed, and Breathwork Coach Rob, to get the details about their exciting new workshop! Our Breathwork(out) is a fusion of energy systems resistance training, vibrant conversation and powerful breathwork that will energize you and positively transform your life. This two-hour workshop at Different Breed is designed for individuals eager to reconnect, embrace the community, and breathe outside of their comfort zone. Breathwork is a form of active meditation done lying on your back and breathing to music, which some argue is the best answer to stress that we have available to us. A rising wellness trend and celeb favorite, breathwork has a tremendous impact on stress, anxiety, digestion, self-realization and overall wellness—effects only amplified when combined with a pre-workout. How did you come up with the concept for the class and what attracted you to breathwork as part of a workout? 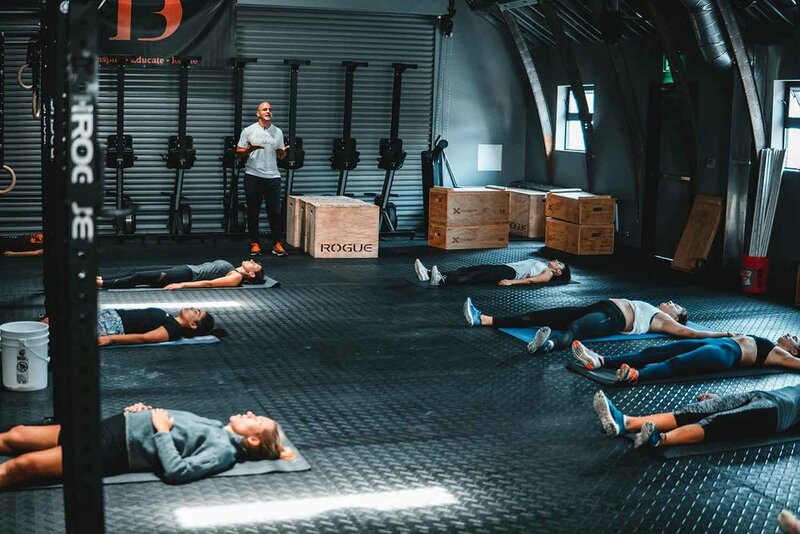 Here at Different Breed, we are always finding new ways to challenge and improve the lives of our clientele through our various intentional fitness offerings. Helping people connect more deeply with and visualize their intentions, breathwork is very aligned with our mission to help our clients become the best versions of themselves. In partnership with LAUNCH Adventure & Wellness Community, we crafted the Breathwork(out) model that combines the benefits of physical fitness (taught by Kyle) with the benefits of Breathwork (taught by Rob) to create a fusion that works the mind and body like no other workout on the market. Is there anything guests should do to prepare for the class? All attendees of the workshop should wear comfortable athletic apparel and running shoes. All they need is a yoga mat and an open mind! What do attendees love most about the class? Everyone's experience is completely different, depending on what they're going through in their life. However, most attendees leave feeling very in touch with their emotions and very connected to both themselves and our community. It's a frequent response that people haven't experienced anything like this before our workshop, and they express a desire to share this experience with others! When can guests attend the Breathwork(out), and what other unique classes can we look forward to in the future? Attendees can follow our full Breathwork(out) series! We will be holding workshops on a monthly basis through the end of the year, with each date announced via our website and social media channels. Upcoming workshop dates include Friday, September 7 from 7:45-9:45pm and Saturday, October 13 from 11AM-1pm. We will also be introducing a weekly Breathwork class this coming fall! In addition to breathwork-oriented offerings, we provide an intensive individual training program and various intentional fitness services at Different Breed. Options include a 30-minute resistance training class, CrossFit, HIGH Fitness Aerobics, vinyasa yoga, all-day open gym and niche transformational offerings. We recently released Different Breed (of Moms) package for just $150. Around the corner from the bustling Silicon Beach, the gym is truly stunning with a spacious/high ceiling structure (originally built to serve as a WWII aircraft hangar), premier equipment and elite trainers that live by the brand's mantra of intentional fitness. For more information visit Different Breed and follow @differentbreedstrength on Instagram! Stay tuned to hear about our Breathwork(out) experience.